Yellow swallowtail with black and white wyvern. This one shown is a true heraldic dragon: four feet, two wings [unlike its modern representation in the Kazan city flag and arms]. Yellow with black and white owl. Those flags are from Allard’s Nieuwe Hollandse Scheepsbouw, Amsterdam 1694 [ala94], and reprinted several times. (See Wilson’s Flags at Sea, 1986, [wil86] p. 114.) These images are probably fantasies of flags used in Tartary, as the empire of the Great Khan was called then. They were used on innumerable flagcharts until the 19th century. Nobody knows which flag this is. «Tartarian caesar» may be Kazan khan, khan of Crimea or khan of Siberia (native people of Siberia was named tartar too). I think most probably version is Crimea khanate, because it was state with navy (and with naval ensigns, of course). Crimea khanate existed in XVII (in times of Alardus). Kazan khanate was destroyed by Ivan the Terrible in XVI c.
So it’s a “tartarian king”, but not necessarily the Kazan Khan. I see. That doesn’t stop however, the Tatar Government to trace a geneologic line from the first Allard flag to the tsarist and current Kazan arms, which show indeed a wyvern. The Speransov’s book [spe74] has also the same abusive conclusion. The coat of arms of Kazan is argent a wyvern [=basilisk] sable langued, tailed and winged gules, beaked and crowned or. The first depictions of the civic emblems occur on a seal of Ivan the Terrible, and, with insignificant alterations in details, on other monuments of the sixteenth and the first half of the seventeenth centuries. A decree of 1766 about this emblem says, «The seal of Kazan bears on it a basilisk, wings gold, end of tail gold.» This depiction, published in the Titulary, fully conforms to the law. But the Kazan coat of arms possesses an earlier origin. Legend speaks thus of the foundation of the city. Kazan was built on a place where there was a multitude of snakes. A Tatar sorcerer lit bonfires and spoke magic words. The snakes perished, but the snake-king Zilant escaped to a neighboring mountain, called Dzhilantai (Snake Mountain). On the site thus liberated people built a city. However, they were unable to live in peace, as the snake-king who had settled nearby brought misery on them. Fortunately, in the city there appeared a mighty magician, Hakim, who was able, by mighty conjurations, to kill the snake-king. In memory of this occurrence a representation of Zilant is still a civic emblem among the Tatars. With the creation in the eighteenth century of the Kazan coat of arms, preserving on the shield an old depiction of a snake, it received a new description: «A black snake, wearing the golden crown of Kazan, wings red, field white.» But in other documents this snake began to be called a dragon. In the nineteenth century in the newly described coat of arms of the former Kazan province the ancient snake-king Zilant (later called a basilisk) is also called a dragon. In spite of the fact that in the old civic emblem, and in the earliest coat of arms of Kazan and of the province of the same name, we undoubtedly have depictions of one and the same, though variously named, winged snake, not all sorts of such fantastic monsters found in Russian symbolism and heraldry have the same significance. For example, the ominous snake-dragon, personifying the evil enemies of the Russian nation, in the old emblem of Moscow possesses a different origin and symbolism. A different significance is given to the winged dragon acribed to the Tatar khans. 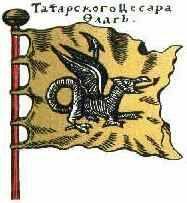 An interesting antique description of this emblem of the khans was published in the work of Carlus Allard (published in 1705 [ala05] in Amsterdam, translated into Russian in 1709 [ala07]): «Flag of the king of Tartary, yellow with a black dragon (great serpent) with basilisk tail, couchant, facing toward the fly.» Attestation of the fact that a dragon, or winged snake, appears as a sign or emblem of the Tatar khans, can also be found among Russian authors, but without description and colored illustration of the emblem.